This is a retro gaming site and thus should have retro related content. But I wrote this review for my Games Development course anyway so I decided that I may as well post it here as well. Enjoy. I’ve never played a full WipEout game before, I’ve only ever played a demo for the very first one on PSone. All I remember of that demo is a lot of in game advertising of Red Bull and a heavy mid nineties electronic soundtrack. I did enjoy the demo, but never bought the game. Fast forward ten years or so and the PlayStation network gets hacked and then taken down. When it finally gets brought back online, Sony gives away free games to say sorry. 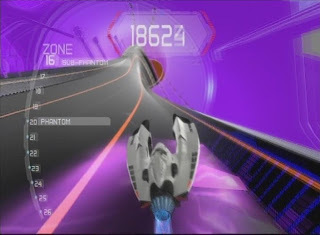 From that I scored WipEout HD for free via download. 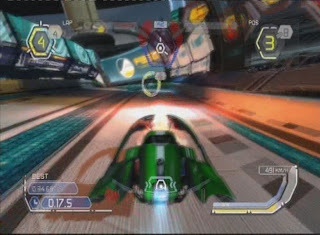 WipEout HD is a futuristic racing game in which you compete in these anti-gravity aircrafts which can be equipped with weapons to use against the opponents. You obtain these weapons by flying over these ‘power-up pads’ which are also used to give you a speed boost. The racing is very competitive so it’s recommend the player tries to fly over these pads before the opponents do. The initial campaign gives you five different Modes in eight different sections. Scoring well in these modes lets you progress onto the other sections with a point system. Most of the modes you would expect to see in a racing game, these include the likes of a Single Race mode and a Tournament mode. They’re just for pure racing. There is also the Time Trial and Speed Lap modes which require you to go as fast as possible. The mode that sticks out to me and is most unique though is the Zone mode. In this mode you don’t have any brakes. It’s set in an abstract environment where the music acts like an equalizer all around you. Every time you go through a ‘zone’ your craft gets faster and faster. The idea is to see how long you can last without crashing. I’ve never played a mode like that before in a racing game so I always looked forward to that whenever I unlocked a new section. The handling on the crafts are quite unique. The fact that they’re hovering gives off the feeling of having no bottom weight, which requires a bit of getting use to. Once you do though it’s quite easy to glide your craft around corners without using the brakes, which are also quite weird. Instead of using the traditional one button stops all type brake you have to manoeuvre these two different ‘air brakes.’ There is one of these on each side of your craft, pressing one on a side will suddenly send the craft in that direction. Whenever I used it, it usually sent my craft straight into the wall so I only used it whenever I absolutely needed to. Usually just letting pressure off the accelerator made the craft slow down enough to easily go around corners. The graphics are quite nice, but are seeming to be a bit dated these days. They were considered full HD when they were released back in 2008 but since HD has come quite far over these last few years, I think if it was released today it would be a lot more polished. Having said that though, they’re not by any means bad. I found the environments to have quite a bit of detail in them. Whenever a race was completed it would pan around the track and you could fully appreciate what has been done since you’re going way too fast during the actual race to notice anything. The futuristic worlds are quite interesting, with huge buildings in weird shapes using a very stylized colourful and bright style. It actually reminds me of certain areas within Mass Effect, like the city parts of the Citadel. The music in it is quite relevant. Its mixes in a lot of different electronica and techno genres, which gives off quite a futuristic vibe. Using such known bands such as Kraftwerk it’s really easy to immerse yourself in this game. You can tell a lot of effort has been put into the sound design. For instance the Zone mode wouldn’t be as cool looking as it is if it wasn’t for the music. This game utilises Dolby 5.1 soundtrack, as well as the music the actual sound effects sound brilliant. Everything just sounds so streamlined. You can really hear the work that has gone into these as well from the rocket thrusters to the lock on sound you hear as you’re about to blow up an opponent. All in all, I really enjoyed this game. Everything about it is just so streamlined, which is what I presumed they were aiming for. The modes are varied, the handling is great once you get use to it, the graphics are great now considering how old it is and the sound and music is quite enjoyable. The only cons I can think of for this review is the air brake system and maybe the fact that the competitors are a bit too competitive in the beginning. It’s a bit overwhelming when you start but after a few races you figure how they work and you use that to your advantage. I feel this game series hasn’t really come a long way since I played that demo for the first one all those years ago. The main improvements are of course the graphics and the lack of in game advertising (which I feel is a good thing) but the game structure has pretty much stayed the same. This is a good thing though as all those years ago they were onto a winning formula, and the fact they haven’t tried to fix something that isn’t broke is defiantly something more developers should realise and do when they make sequels for excellent games. 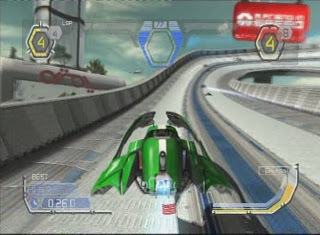 The WipeOut games were critical successes in the EU market - I was very jealous of my Playstation-owning friends when I compared the serviceable ports on the Saturn to the originals. This reminds that I should get off my arse and grab NTSC versions of them for my PSone, simply because the 60hz refresh rate will be smoother/faster than playing it in 50hz. 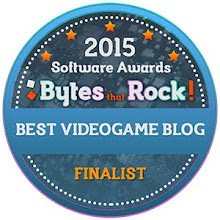 Great writeup btw, always great to see the series getting attention. WipeOut 2097 was a childhood favourite, and I'm surprised I managed to get as far as I did at such a young age. If I ever get a PS3, I'll probably check this out. A good review, nice one. On an unrelated note, hows abouts an update on your Game Gear? I'm still pondering as to whether to invest in the very same capacitor replacement pack you bought, but have been put off even more by the difficulty you've been experiencing with the soldering. Let us know how it's all going! Um... yeah lol. I went to resolder my first job, which was terrible. I was cleaning the very first solder point for the first cap I desoldered with a toothbrush and some rubbing alcohol when the very first solder point completely came off. The corrosion (from the original cap) seemed to actually be under the solder point its self. So now I can't solder on that cap, which of course means the whole thing doesn't work regardless how well I did all the other ones (which all cleaned up pretty nicely). There is a way to solder directly into the board apparently, I haven't really looked into this yet though. I don't have a Game Gear handy to confirm, but assuming it's a standard PCB, there will be a layer of laquer or plastic on the traces on the board. If you can gently grind back the plastic you can solder to the raw trace on the board. When doing this, put a bit of solder on the trace, tin the capacitor, then solder the two together. In other mods where you have to cut traces (e.g. Sega Mega Drive 50/60hz or language switch mods), you have to first grind away the protective top layer, then the tacit feel changes as you start to grind away the copper, then it changes once more when you hit the actual PCB material. GameSX (http://www.gamesx.com/) has a good, basic guide on soldering principles, but I'm sure there are other tutorials out there on YouTube as such. Practice makes perfect!